April 20, 2017 — I can trace my six-foot-deep love for cemeteries back to a single moment. And Karl Marx. The year was 1999. Late spring. My penultimate semester in college. I was traveling around the United Kingdom by train with a sizeable group of fellow English majors. One morning, I convinced two of them to trek with me to north London on a quest to find the grave of Karl Marx in Highgate Cemetery. And I say quest because this was a time before mobile phones, back when the Internet itself was a mewling thing. 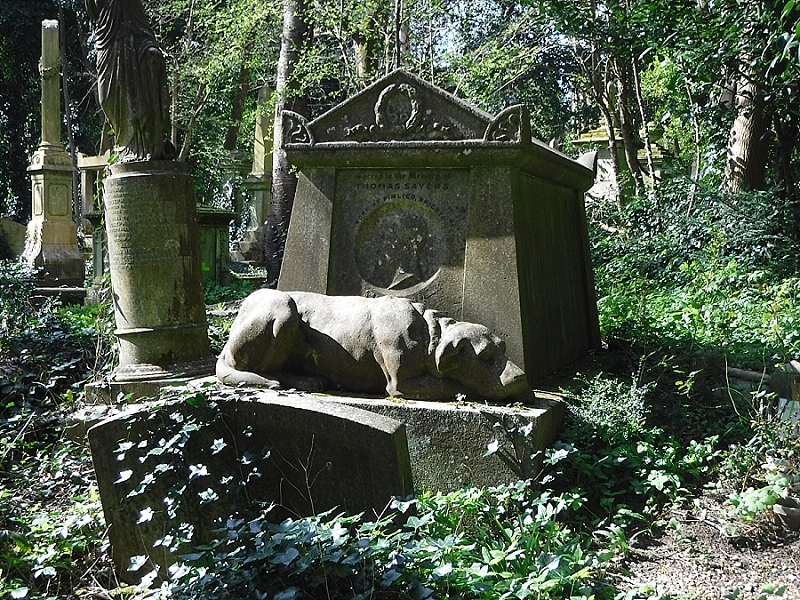 Realistically, I only had a 20% chance of even finding north London itself, much less Highgate Cemetery. I wasn’t going to Marx’s grave because I was into famous graves. That wouldn’t happen to me until later. It just so happened that his molder spot is topped by a giant bushy bust of his Santa Claus-like head atop a squat column. 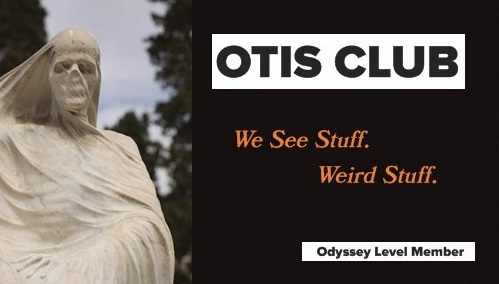 It’s more like a civic monument than a gravestone. Had it been erected in Piccadilly Circus, I would have quested there instead (with a 35% chance of success). Strangely, I also wasn’t really into Karl Marx, either. I had been recently reading him, and this was supposed to be a literary trip, and it seemed a solid way to put some distance between me and other people on the trip. I remember us taking the Tube out to a region that our passes didn’t cover, getting lost, walking uphill until our legs burned, and then leaving my two compatriots behind on a bench while I soldiered on alone. But I found it. 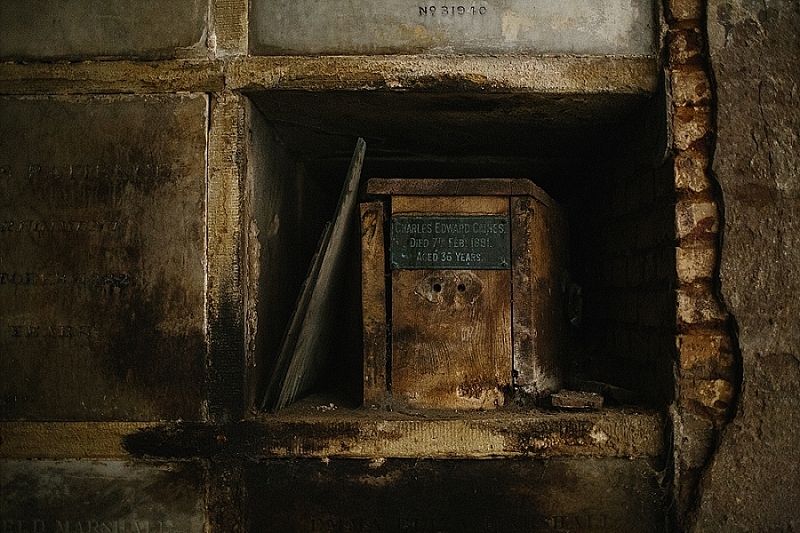 And minutes later, I found the grave, nabbed a photo with my disposable camera, and left. I spent no more than ten minutes there. But I took with me much more than a photo. Unbeknownst to me at the time, I took out of that cemetery a seed nurtured in ancient cemetery dirt that would years later sprout into a cemetery obsession. That atmosphere. That overgrown, crumbling beauty. That sense of quiet and perspective. I found myself thinking about it often over the years. 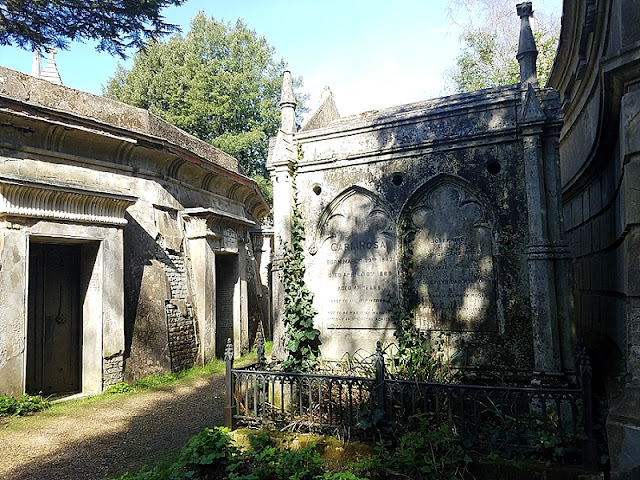 Earlier this month and hundreds of cemetery visits later, I returned to Highgate Cemetery. And explored it for reals. Highgate Cemetery was established in 1839 as part of a plan to create seven cemeteries (nicknamed the Magnificent Seven) outside of London to solve the city’s dead body problem. They just didn’t have enough space to plant them. Only small churchyards that were already bursting at the borders. And good call, too, because today, Highgate alone has 170,000 people buried in it. Visiting the cemetery on Swain’s Lane is slightly more complicated than visiting most cemeteries. First, there’s a fee. Second, it’s divided into two cemeteries, the East Cemetery and the West Cemetery. The West you can only visit as part of a tour…which can be a great way to visit a cemetery, but is never my first choice and certainly I hate it when it’s my only choice. But take it we did. Because I was exploring this place for reals. You can tell I’m an English major. We did the West Cemetery first, so that we could explore the East Cemetery afterwards at our leisure. 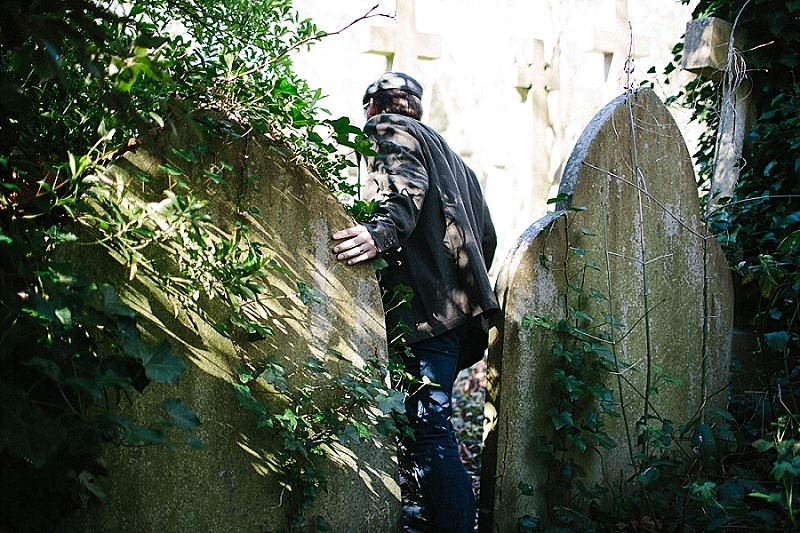 Thirty seconds into the tour, I wanted to bolt off into the ivy-covered stones and shaggy pathways. It was a magnificent place, with intriguing architecture peeking out through solid coverings of creeping vegetation like it was a lost city. It looked like the backdrop for a 1970s horror flick, and that’s probably because it was regularly used that way. It’s featured in such films as Taste the Blood of Dracula, Tales from the Crypt, The Abominable Dr. Phibes, and From Beyond the Grave. I expected to run into Peter Cushing around every wild bend (since, you know, it’s a mystery where he ended up anyway, and forever wandering the paths of Highgate Cemetery seems a glorious fate). Highgate attained its signature overgrown and abandoned ambiance after a period of disuse in the 1970s. Nature and vandals and squatters and horror film productions ran rampant over the place. Eventually, it got respectable again, but there weren’t enough funds to completely clean the place up. Nowadays, the effect is rightly recognized as too fantastic a one to sanitize. 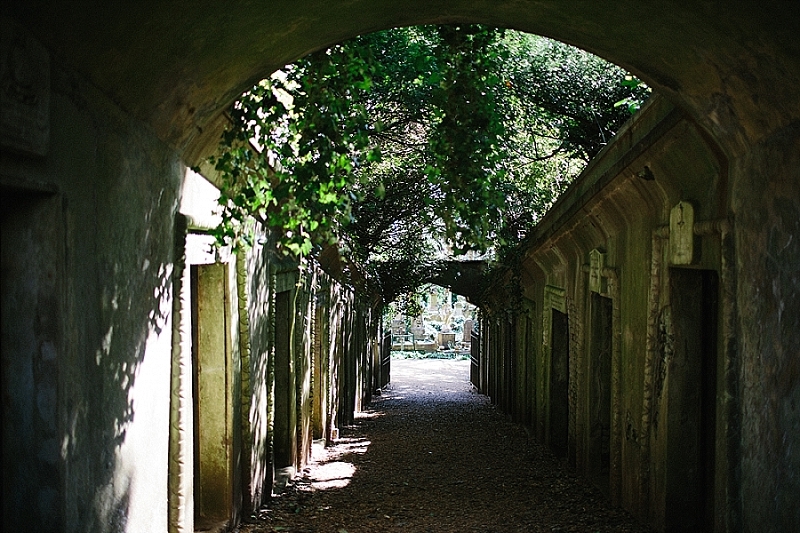 The best thing about the West Cemetery is its architecture. 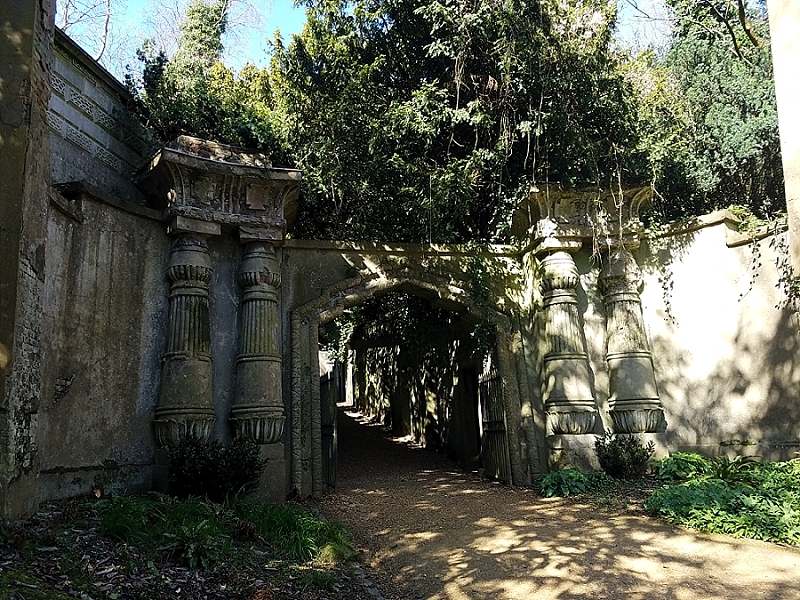 We walked through the exotically beautiful gates of Egyptian Avenue, a tunnel-like path filled with family catacombs and (the guide warned us after we passed) spiders, which Neil Gaiman used as a setting in his The Graveyard Book. Egyptian Avenue exited into the Circle of Lebanon, a rotary of crypts topped by a massive cedar tree that predates the cemetery. 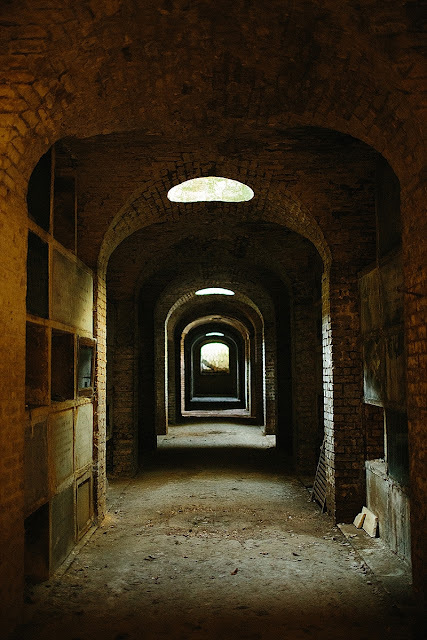 From there, we entered the Terrace Catacombs, a dark hallway of a crypt where missing catacomb shelf plates bared their caskets to the air and our intrusive eyes. These days, I always look for the graves of famous personages when I’m in a cemetery, but the tour didn’t pass any (Karl is in the other half of the cemetery). Although there were some interesting interments. Like the first person every buried in Highgate. She rests under a block of stone almost completely lost in the undergrowth. 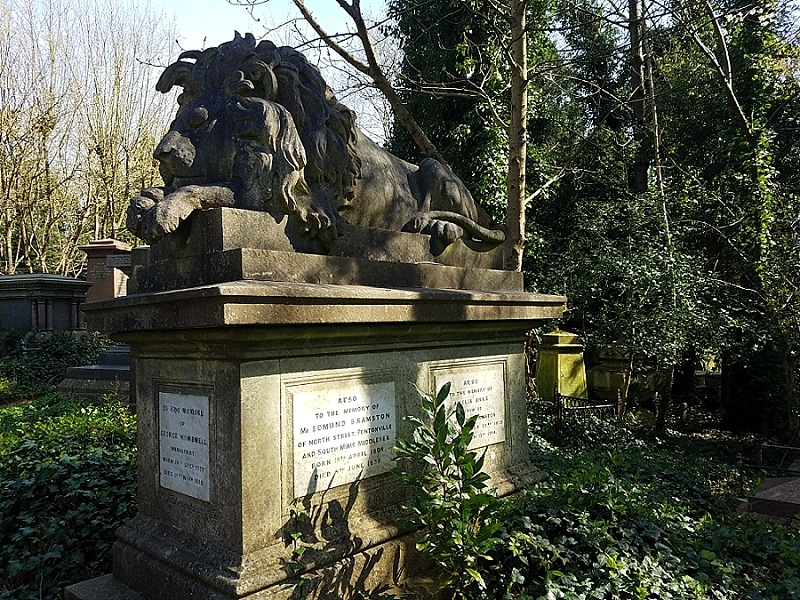 A lion statue marks the grave of a menagerist. And a stone dog lies forever at the grave of his master. Although the tour didn’t include them, Charles Dickens’s family is buried somewhere therein, as well (the author himself is in higher class digs over at Westminster Abbey). At one point, someone in the tour asked about a simple, polished gravestone that was obviously newer than its surrounding companions. The gravestone had a photo of the interred sitting in a frame at its base. “Alexander Litvinenko,” the tour guide said. “He was a Russian spy who defected and was assassinated with some kind of radioactive element as part of a Russian plot.” The radioactive element was polonium-210. It had been placed in his tea. I remembered the image of the man on the news back in 2006, completely bald in a hospital bed, and obviously doomed. Speaking of plots, the tour guide also told us that plots are still available at Highgate, although they’re expensive. I would learn later that three days after our visit, George Michaels was buried there. After about an hour, the tour ended, and we crossed the street like racehorses out of their gates into the freedom of the East Cemetery.